I’m sick with a bad head cold. I really didn’t want to blog, but hated to break my streak. 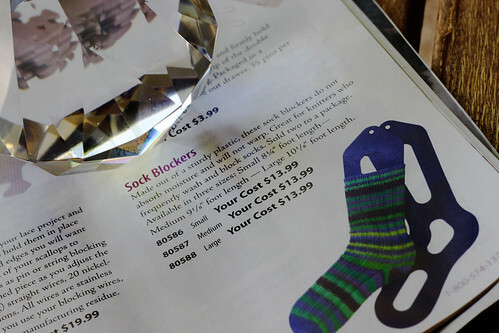 The Knit-Picks mailer came today and I saw these sock blockers. The price on these is great, just don’t know if they can withstand the steam iron. Wooden ones are so much more expensive that I almost want to buy a jigsaw and make my own. It was a little windy on the porch so I brought out the Tiffany paperweight that I keep on the nice stuff table in the living room. Like more than 5 lifetimes ago I worked on a movie directed by John Landis, whose wife, Deborah Nadoolman, was the costume designer. She liked our work so much that she gave everyone a paperweight from Tiffany’s. This little knickknack has survived so much including the Northridge earthquake. That was like 4 lifetimes ago. Well, it seems that way. The cold medication is messing with my brain. This entry was posted on Wednesday, May 20th, 2009 at 3:00 am and is filed under Knitting. Tagged: Knitting. You can feed this entry. You can leave a response, or trackback from your own site.